Finally, The Scribblers and Ang Mamamahayag, the official student publications of Alabel National Science High School in English and Filipino, respectively, brought home awards from the Regional Schools Press Conference. 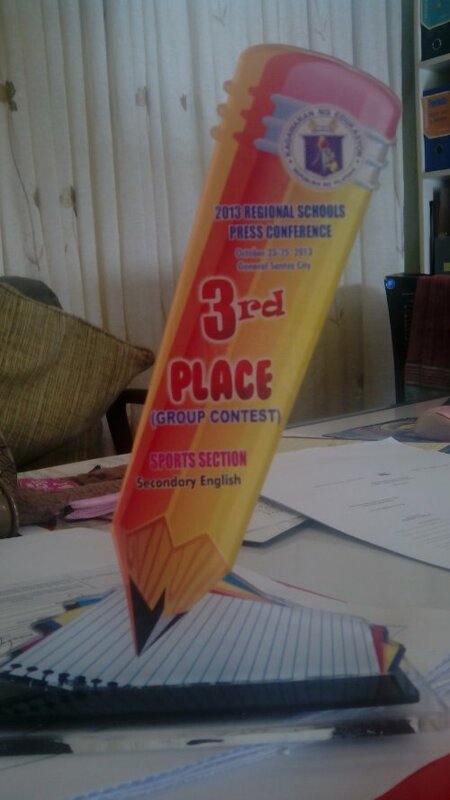 The Scribblers won 3rd Place in Sports Page, 5th Place in Science Page, and 7th Place in News Page, while Ang Mamamahayag won 7th Place in Pahinang Agham at Pangkalusugan, and 8th in Pahinang Panglahalain. The first three awardees per category received trophies during the awarding ceremonies held at Sun City Suites last Friday, March 14. School paper advisers Annabel Erolon and Ariel Lalisan of The Scribblers, and Aleli E. Dasmariñas and Rolando Nerpiol Jr. of Ang Mamamahayag are happy that, at last, the school publicaitons have finally caught the eye of the evaluators. Posted in Achievements, News, Uncategorized and tagged journalism.